Earn up to 2,160 reward points. Thick back beats from a thick-shelled, vintage-inspired snare. The PDP by DW Concept Series Wood Hoop Maple Snare is the perfect snare to add a new, classic sound and feel to your setup. It delivers warm fat back beats thanks to a thick 20-ply all-maple shell. 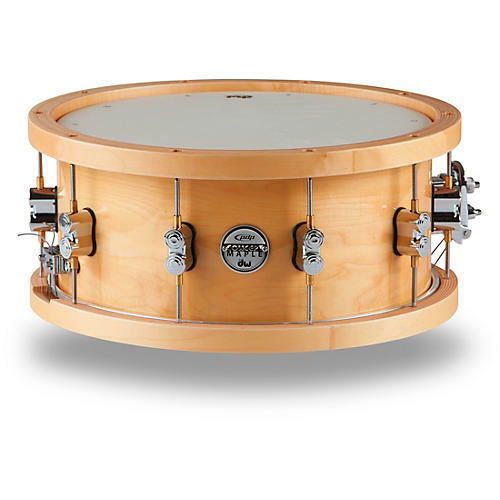 The natural lacquer finish shows off the quality wood grain that makes this snare look as good as it sounds. Other features include matching maple-plied wood counter hoops, chrome dual turret lugs, and DW MAG Throw-Off for increased sensitivity and articulation.